When is it the right time to give solid foods to a baby? According to a recent study, set to be published in the April issue of Pediatrics, that’s the golden question for more than a quarter of all U.S. moms. And not knowing the answer to that question, study authors say, can place babies at risk for a slew of health immediate and long-term health problems. 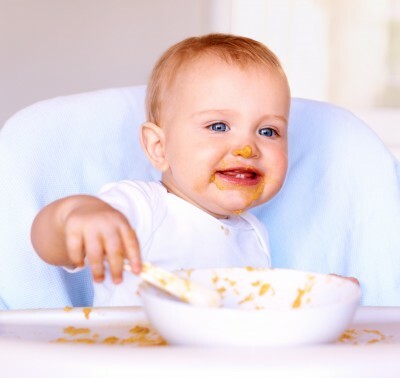 Based on information from the American Academy of Pediatrics, infants don’t develop the coordination or head and neck control needed to consume solids about four months of age. What’s more, the group says the benefits of exclusive breastfeeding – recommended until six months of age – are dampened by introducing solids too soon. But these immediate issues aren’t the only concern, study authors from the US Centers for Disease Control and Prevention (CDC) say. There are also some long-term health complications – complications like a lifelong battle with obesity, diabetes and celiac disease. So just how many moms are failing to follow the guidelines, when are they introducing them, and why are they failing to follow the AAP’s recommendations? That’s exactly what CDC researchers wanted to know, and even they were surprised by the answers they came up with. After analyzing a monthly record of information from 1,334 mothers on why and when they introduced solids to their babies, researchers found that formula fed infants were twice as likely to be fed solid foods before their babies turned four months old – 54 percent compared to 28 percent. And around 8 percent of mothers introduced solids at one month of age or sooner. Mothers most likely to offer solids sooner included those that were single, younger, had less of an education, or were in the federal Women, Infants and Children (WIC) program. “We didn’t expect to see so many (give solids) before four months,” study co-author Kelley Scanlon, an epidemiologist with the CDC told Red Orbit. She did note, however, that previous studies have asked mothers to recall the same information two or three years down the road; this study asked mothers to recall what they’d fed their babies within the last week. This could account, at least somewhat, for the higher than expected percentage. As for the why mothers are feeding sooner than recommended, the majority of mothers (89 percent) said they did so because they thought their babies were ready. An alarming 71 percent said that their baby seemed hungrier than usual. For 67 percent of the mothers said they started introducing solids because their babies started showing an interest in solid food. A total of 56 percent said their health care provider had recommended that they start solids. Only 8 percent said their baby had a medical condition that may have been helped by eating solids. Scanlon said the findings “don’t offer a full understanding of why, but they give us some insight,” as to why mothers are introducing solids so early. But Gagin believes the information may indicate that good, supportive information needs to be given to mother sooner.